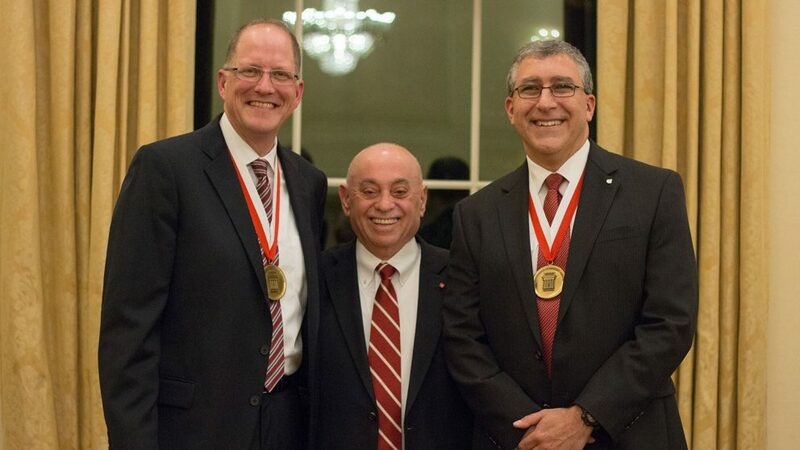 Dr. Louis A. Martin-Vega (center), dean of the College, recognized 2017 Distinguished Engineering Alumni Basil Hassan (right) and Alan Icenhour (left) at a banquet on Nov. 1. The College of Engineering at North Carolina State University named the Distinguished Engineering Alumnus award winners for 2017. The recipients are Basil Hassan, senior manager of the Thermal, Fluid, and Aero Sciences Group for Sandia National Laboratories and Alan S. Icenhour, associate laboratory director for the Nuclear Science and Engineering Directorate at Oak Ridge National Laboratory. Dr. Louis A. Martin-Vega, dean of the College, recognized Hassan and Icenhour at a banquet on Nov. 1. The award honors alumni whose accomplishments further their field, foster professional development of young engineers and bring distinction to the University through engineering achievement. Hassan earned his bachelor’s (1988), master’s (1990) and doctoral (1993) degrees in aerospace engineering from NC State. Upon completing his doctoral degree, he joined Sandia National Laboratories in Albuquerque, New Mexico and has held a variety of management and staff positions, overseeing all aspects of engineering sciences research, development, and applications work. Currently, he holds the title of senior manager of the Thermal, Fluid, and Aero Sciences Group. He helped support NASA to determine the cause of the Space Shuttle Columbia accident in 2003, and was part of the team to support the shutdown of the Deepwater Horizon Oil Well after the explosion and spill in 2010. He is a Fellow of the American Institute of Aeronautics and Astronautics, including serving on its Board of Directors from 2008-17, where he held the roles of director and vice president. He has also served on review boards for the National Academies, NASA, and Air Force Office of Scientific Research. He currently serves on the NC State Mechanical and Aerospace Engineering Educational Advisory Board, and has served on similar boards for New Mexico State University, Texas A&M University, University of Texas at Austin, and University of New Mexico. Icenhour earned his bachelor’s degree in nuclear engineering in 1986 from NC State. He also holds M.S. and Ph.D. degrees in nuclear engineering from the University of Tennessee, where he is an adjunct professor of nuclear engineering. He was a commissioned officer in the U.S. Navy on a nuclear-powered submarine and continued his service with the Navy as a reservist until retiring in 2010 at the rank of captain. He joined the Oak Ridge National Laboratory in 1990, serving in various roles including principal investigator, research group leader, director of three research divisions, and his current role as associate laboratory director for the Nuclear Science and Engineering Directorate. He has more than 30 years of experience in nuclear reactor operations and R&D on topics such as enrichment, radiochemical processing, radioisotope production and applications, nuclear fuels, radiation effects on materials, radioactive waste management, and nuclear security. He was elected a Fellow of the American Nuclear Society and chairs the NC State Nuclear Engineering Department Advisory Committee.